A couple of years ago, my friend and I were in Vancouver and all of a sudden I got a hankering for something bread-like, tasting of rosemary and salt. The hankering turned into a fierce, unwavering craving and I told my friend; I was on a mission. She was doubtful of our finding such a specific snack, but lo and behold, while wandering unsuspectingly through a fun marketplace, our eyes landed on a beautiful display of fluffy foccacia studded with rosemary, glistening with olive oil and sparkly salt crystals. I think I gasped, my eyes may have started to fill, I don’t know, but our mouths were definitely hanging open enough for the guy manning the counter to ask what was up. He happily served up some warm fluffy salvation with a chuckle. It was one of the most fulfilling experiences. This is what these crackers remind me of. I found this recipe on the Food & Wine website a couple weeks ago and we ate them so fast that I’ve made it two more times since them. These crackers are the best. A great vehicle for bleu cheese…or any kind of cheese. 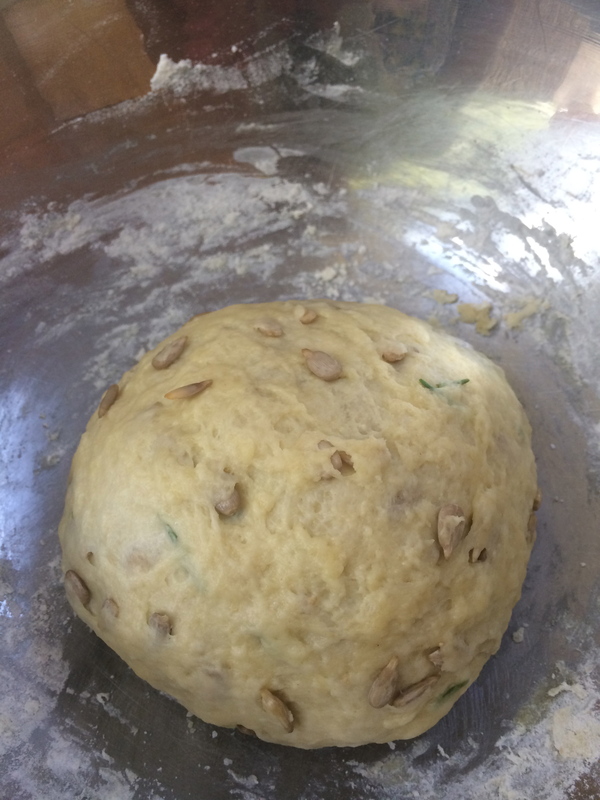 In a large bowl, mix the flour with the sunflower seeds, rosemary, yeast and 1 1/2 teaspoons of salt. Stir in the water and 1/4 cup of the olive oil until a dough forms. Turn the dough out onto a work surface and knead until it becomes a smooth ball, about 5 minutes. Transfer the dough to a bowl, cover with plastic wrap and let stand for 2 hours. Preheat the oven to 350°. Turn 2 large baking sheets upside down. Divide the dough in half. Set 1 half on a baking sheet and roll it out to a 9-by-15-inch rectangle about inch thick. Trim the edges to make a neat rectangle. 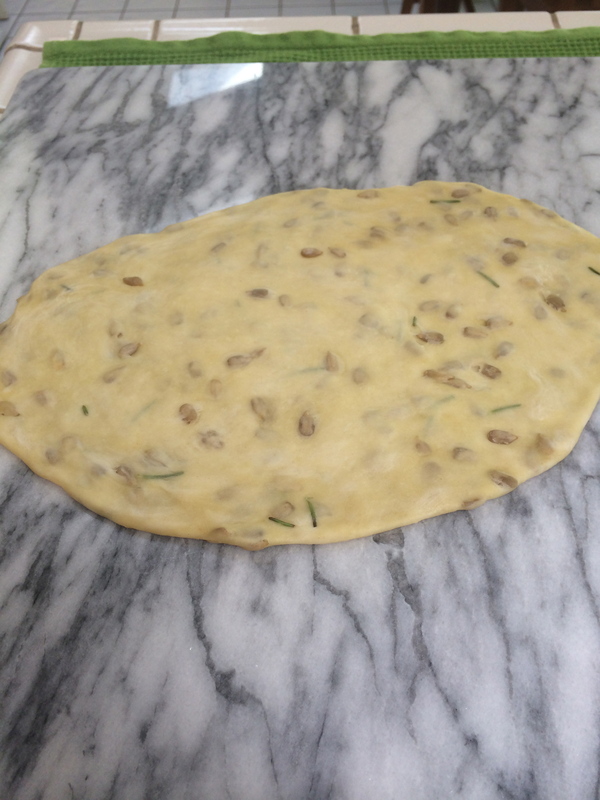 Using a sharp knife, cut the dough crosswise into 1-inch-wide strips. Drizzle the tops with 1 teaspoon of the oil and season with salt. Repeat with the remaining dough and oil. 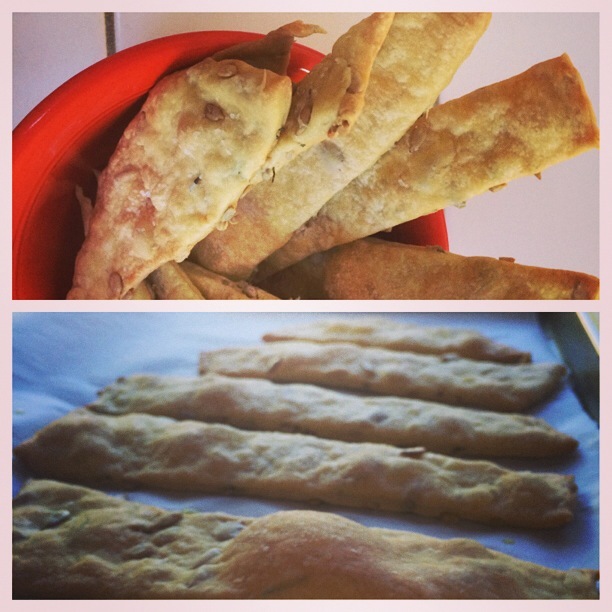 Bake the crackers for about 28 minutes, until golden. Let cool completely before serving.